Keeping the peace requires understanding what the two sides want out of the dispute. The diplomatic standoff between China and Japan is drifting in the direction of military conflict. At the World Economic Forum in Davos in January 2014, Japan’s Prime Minister Shinzo Abe made an explicit analogy between the current Sino-Japanese rivalry and what had happened between Great Britain and Germany before World War I. A coming conflict between China and Japan in the East China Sea would seem to be a matter of not if but when, should this kind of vicious provocation continue. Knowing what China and Japan really want from the East China Sea dispute is the prerequisite for any meaningful efforts in maintaining peace in the region. The U.S. should help China save face, in order to restore the status quo in the East China Sea, and put a stop to Abe’s agenda of revising the Constitution before it’s too late. Chinese President Xi Jinping came to power during the East China Sea flare-up between China and Japan in late 2012. The anti-Japanese protests and riots inside China after Japan’s nationalization of the three disputed Senkaku/Diaoyu islands became the first political challenge that Xi had to face even before his formal takeover of power inside the Chinese Communist Party (CCP). To defuse domestic anger, Xi chose a heavy-handed approach toward Japan by routinely dispatching maritime surveillance and fishery law enforcement ships to the disputed area. In November 2013, China announced its Air Defense Identification Zone (ADIZ), explicitly covering the Senkaku/Diaoyu islands. This action further fueled the tension between the two nations, ending with Abe’s Shrine visit. People may say that Xi is using the island row for power consolidation. That may have been true in late 2012, because Xi had no choice but to be tough when his political power was at stake during the transition. However, this argument no longer holds true, since Xi has successfully strengthened his position in the CCP. Xi may be thinking right now about how to ease Sino-Japanese tension so that he can focus on dealing with domestic ethnic conflicts in Xinjing as well as deepening economic reforms. After all, he should know that he cannot achieve the “Chinese Dream” simply by provoking Japan in the East China Sea. Even if China retakes the Senkaku/Diaoyu, it does not mean that Xi can claim a victory of national rejuvenation. What Xi wants in the East China Sea is some kind of concession from Japan, even if it is only rhetorical in nature. According to China’s tradition of reciprocity, Japan has moved forward a “foot” by nationalizing the three disputed islands. Therefore, China should at least get back an “inch” by forcing Japan to recognize the existence of the dispute in the Senkaku/Diaoyu islands. Both China’s routinized patrols and the later announcement of the ADIZ are aimed at achieving this limited goal. Abe was elected after the “nationalization crisis” over the Senkaku/Diaoyu islands in December 2012. He is therefore not the one originally responsible for the strained relations between Japan and China. However, Abe has done nothing to deescalate the tensions. His Yasukuni Shrine visit in December last year further pushed the already fragile relationship with China toward its nadir. What does Abe want from the dispute? The first logical guess is that he wants to stay in power. Embracing the right-wing position by provoking China can boost Abe’s popularity, at least domestically. 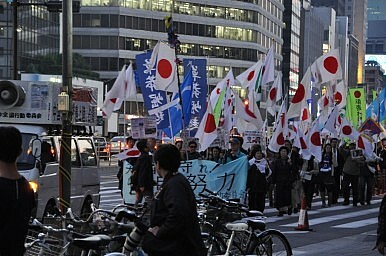 However, Abe should know that his domestic support is based more on Japan’s economy than on his “China bashing” tactic. Damaging its relations with China, Japan’s largest trading partner, may not be a wise choice for any Japanese politician seeking re-election. Abe’s ultimate goal in the dispute with China is apparently to change the Constitution, which renounces Japan’s right to resort to war. As a highly conservative leader, Abe holds a political dream of restoring Japan’s normalcy by changing the Constitution imposed on the country by the U.S. after World War II. In early January, Abe’s Liberal Democratic Party (LDP) dropped the pledge of “never wage a war” at its annual convention in Tokyo. Abe himself also announced that it is time to revise the pacifist Constitution. The next foreseeable step for Abe is to choose the right moment to remove Article 9 of the Constitution so that Japan can be free to exercise its military might. For Abe, a “normal” Japan may be more valuable than a “rich” Japan although Japan’s normalcy will inevitably remind people in most Asian capitals of its past militarism. The Senkaku/Diaoyu dispute provides the best excuse for Abe to implement this game changing plan. Abe can use China’s provocations to demonstrate the need for a Constitutional revision. On the one hand, Abe can show the sovereignty card to mute the domestic opposition. On the other, Abe has used the security treaty to drag the U.S. into the disputes. There is thus no incentive for Abe to soften his tone on the island row, even in a rhetorical sense. Indeed, it is more likely that Abe will intentionally escalate the dispute because there is no better stimulus to legitimize the revision of the Constitution. The risk of conflict between China and Japan is growing. China needs a way to save “face” in the dispute, but Japan is unlikely to be forthcoming. Historical memories, burgeoning nationalism and strategic competition have seemingly pushed the two nations to the brink of conflict. Even if cooler heads in Beijing finally realize Abe’s ultimate agenda, China still faces a dilemma of how to defuse the island row by itself. The U.S. did send high-ranking officials in an attempt to put out the flames in both Beijing and Tokyo in January 2014. However, these efforts are likely to be unsuccessful because Washington showed that it has been hijacked by Abe when it publicly promised to defend Japan over the Senkaku/Diaoyu dispute. That U.S. pledge gives Abe the cover he needs to challenge China. If the U.S. wants to maintain peace and stability in Asia, it should use its power and influence to stop Abe’s plan to revise the Constitution. Putting first things first, the U.S. should persuade Japan to acknowledge the existence of the dispute with China over Senkaku/Diaoyu. This rhetorical compromise will not change the fact of Japan’s effective control of the islands, but it will give Xi the “face” he needs to show his domestic audience before easing tensions with Japan. Hopefully, the cooling of the island row will dissuade Japan from changing the Constitution. China’s rise may not send Asia back to the future, but Japanese militarism certainly would. Kai He is an Assistant Professor in the Department of Political Science at Utah State University. He is the author of Institutional Balancing in the Asia Pacific: Economic Interdependence and China’s Rise (Routledge, 2009) and the co-author of Prospect Theory and Foreign Policy Analysis in the Asia Pacific: Rational Leaders and Risky Behavior (Routledge, 2013).